Celebrating four years on Steam! 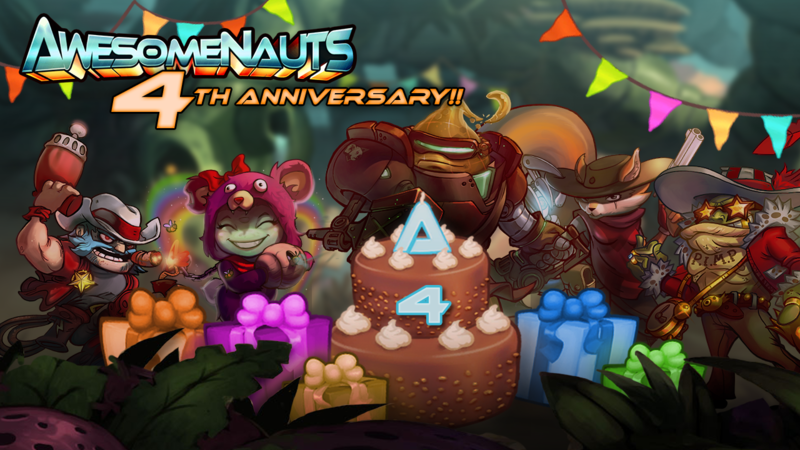 Today marks the fourth anniversary of Awesomenauts on Steam, and it’s been one hell of a ride! Thanks to all our players, fans, and community members for making this a fantastic time and for inspring us to continue to make the game bigger and better! Awesomenauts has grown an incredible amount since August 1st 2012, and to make a long story short: we’ve got a lot more coming! The support we’ve received from our community inspired us to start the process of overhauling the matchmaking system more than a year ago. Like so many other features we’ve done over the years, this one has grown into something much cooler than we originally anticipated and has taken a little bit longer to develop than expected. However, we’re finally nearing the point where it can go live! The first Open Beta that started on July 20th revealed some issues and we’re gearing up for a new round of Beta to start this Wednesday. Almost all of the issues that came up during the Open Beta have been addressed, so be sure to check it out! The Beta will be available for several days, just like last time, and once we’ve had time to look at the issues that came up we’ll let you know how we’ll proceed. Beyond Awesomenauts 3.3: Rise of Galactron we’ve got a lot more awesome content planned. Work on the Spectator Mode is underway, and there is more cool stuff lined up for the coming months. From everyone at Ronimo, thanks for your support and your love for Awesomenauts. Stay tuned, and stay awesome!